My sister-in-law shared this recipe with me. She got it from a bed and breakfast she stayed in. These cookies are soft and chewy, a little butterscotchy with sweet powdered sugar gathered in the crinkles. Yum! Add beaten eggs and vanilla and beat till combined. Stir together the dry ingredients and then mix with the wet ingredients. Form into balls and roll them in powdered sugar. Place on cookie sheet and press the balls down a bit. Bake at 375 degrees for 8 min or so. Don’t over bake them. These look great too. Anything that comes out of a B&B is awesome to me. Love 'em!!!!! I love amish recipes, plus its form a B&B they looks so soft and good. Thanks for sharing. All these look good! I think I could take in calories just by reading your blog! When are you going to install scratch ‘n’ sniff? Thanks for the birthday wishes…I’ve answered the questions for you in the comments of that post! There’s always such tasty things here! Yum! These must be so yummy! Did you know that if cookies contain oatmeal, they are healthy? It’s true. You can eat as many as you wish. Thanks for stopping by my blog! Good tip on the dark purple. (sigh) Many days I don’t even make it out of my pajamas!! Oh, and these cookies look DELISH! Those look yummy! How often do you bake? Or are those for Christmas? Oooh, yum, yum. This looks great. Love your blog. I will be returning! YUM! These are being added to my weekend baking plans. Those sound so yummy! They look delish also! MMmmm, visiting from SITS! Oh, these look so good. I just did Amish Friendship bread a couple posts ago. I’ll have to try these. They look really good! I’m definitely going to have to try them! These look so good and so simple. I love to make Amish recipes they are so simple and tasty. I cannot imagine preparing such a big informative post! You are truly amazing!! I will check this list often – thanks so much. Love oatmeal cookies–these look yum! These are AMAZING!!!! I will never use another oatmeal cookie recipe. I made them yesterday for my hubby’s birthday and they are gone…each and every one of them. Everyone wanted the recipe! They really are the best oatmeal cookies I have ever tasted. They are crispy on the outside, soft on the inside, have a hint of brown sugar that blends with the oats and then the powdered sugar on top gives your mouth a sweet bit with each bite…amazing…pretty sure I gained 5 lbs yesterday. Be warned to watch out you cannot eat just one!! Thank you for posting it!! Has anyone tried using regular oatmeal? Just wonder how it will turn out. I haven’t tried that, but the oat pieces will be bigger and the texture not as good I don’t think. Quick oats are just chopped regular oats. You can make them in a blender if you’re careful to not chop them too much so you end up with an oat flour instead of quick oats. 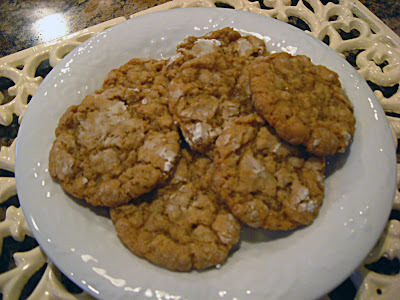 Usually add walnuts and raisins to my oatmeal cookies…… Will they work in this recipe? You could try it, but these have a different texture than the usual oatmeal cookies.